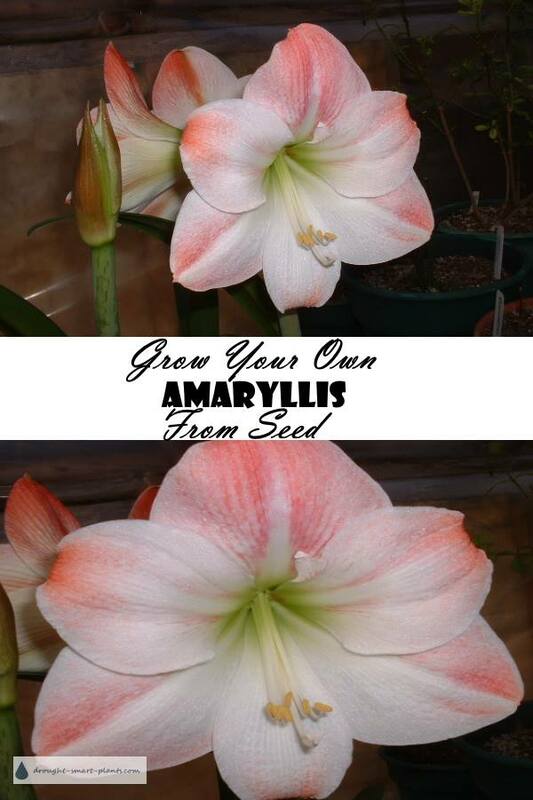 Amaryllis are some of the most beautiful flowering bulbs. They come in all colors of red, pink, and white, sometimes streaked and blushed with variations of the same colors. The flowers are huge and trumpet shaped, usually one or two to a stem, and lasting for several weeks before fading. 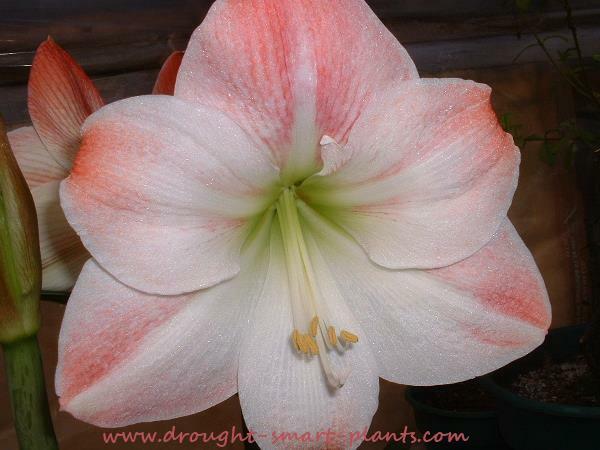 Called Hippeastrum by the original discoverers, the common name of Amaryllis is much nicer. They are most often sold as a planted bulb, which is also huge, and will fill the pot almost completely. This is how they prefer to grow; extremely crowded. They flower starting in early winter, and depending on the variety they can be counted on for a colorful display through to mid January or later. They need bright light, and can withstand fairly warm temperatures, but the flowers will wither much more quickly if the humidity is too low. I found that they will do very well in a bathroom, as long as the light is bright enough for them. Generally, the air is warm and moist which they prefer. The leaves are long and straplike, and emerge after the bulb has completed it's flowering stage, and they replenish the bulb for next years blooming - it's important to allow them to store up some energy for this by letting them wither away in their own time. A dry dormancy is best to encourage them to bloom again. So, for growing them from seed, keep in mind that this can be a long term prospect. What Color Will My Amarylis Be? Honestly, there is no way to know. That's the fun and mystery of growing plants from seed. They could look just like one of the parents, be a mix of characteristics from each of them, or be a throwback, taking on the traits of a far distant ancestor. Those gigantic bulbs took over three years to develop to that size in specially controlled situations in a greenhouse, so you can expect them to take at least that long to get to flowering size. The best way to collect your own seeds is to make sure you have two different plants so that the flowers can be cross pollinated. In their natural habitat, they would depend on insects to do this crucial step, but you can do it with a paint brush, and dab it around on one flower to get some of the pollen on it, then transfer it to the other flower. The anthers are where the pollen is produced - you can see the pale gold color of the pollen in these long wand like structures. The pistil is longer and that's where the seeds will be after they are fertilized by the pollen of an unrelated plant. Once the flower is pollinated, the petals will start to wither (they've done their job, after all) and the seed capsule will get larger. Leave it until it looks as though it's starting to dry out, and then cut it off. 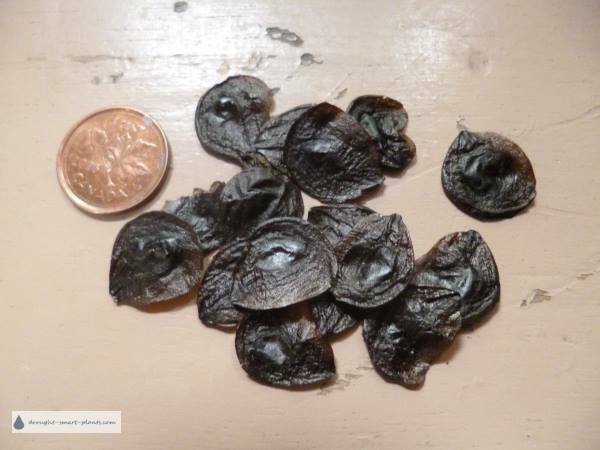 I dry my seeds in a paper envelope or bag so as not to lose the seeds if the capsule shatters. It's not so important with Amaryllis as the seeds are larger than many other types of plants, but it's easier if they stay confined in a bag. After the seed pod changes color, usually to a pale beige color, you can carefully pull it open and retrieve the seeds. They are usually black and contained in a papery flat package. Plant the whole thing. 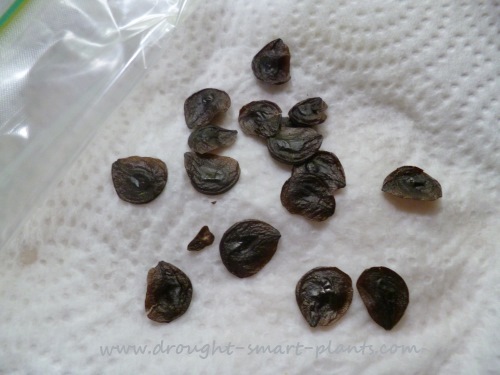 As a tropical plant, the seeds only need to be mature, and don't need any special treatment (such as stratification or a cold period) to germinate. To ensure that you can keep tabs on the germination sequence, you can use the 'rag doll' method. 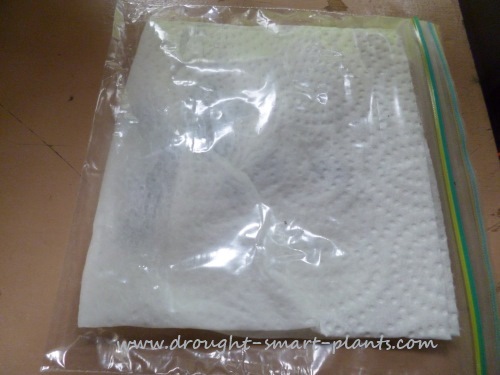 This is a damp paper towel folded over the seeds, and then placed in a plastic bag. It's important to check on them frequently, so you can see when they germinate and pot them into sterilized potting soil right away. The tiny cotyledon and root are very fragile, so transplant them as soon as you see that they are emerging. Using sterilized potting mix, put several seeds into a four inch pot, and put them in a bright area, not in full sun. They will take up to a month to germinate, and they will look just like grass, being a monocotyledonous plant - they only have one seed leaf. 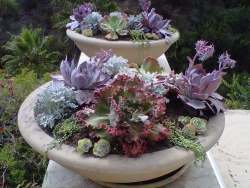 The best situation is to put them outside on a patio or porch for the summer, and water to keep moist. They like compost tea on occasion and will gradually form a bulb, most likely in the second year. By year three, they may even bloom, given the right conditions of summer drought, and then gradually brought out of dormancy by watering in the fall.